Complete the BLADE® reader survey and get a 25% off coupon to ShopBlade.com and possibly win one of 10 free one-year BLADE subscriptions. The best way for BLADE® to fulfill the needs of its readers is to go right to the source—the readers themselves. If you read BLADE, you can help us satisfy your knife lust by taking our BLADE READER SURVEY. Not only will you help us help you, but by completing the survey you will get a special 25-percent-off discount code that you can use at ShopBlade.com through Nov. 10, and an opportunity to enter our drawing to possibly win one of 10 one-year subscriptions to BLADE. What kinds of knives do you like reading about? Tacticals, EDCs, bowies, folders, utility knives, factory or custom, contemporary or antique? Do you like to read knifemaker and/or knife company profiles or do you prefer stories on how to make knives, how to collect or how to use them? Or are your tastes geared more toward knife testing, knife design or the materials to make knife blades, handles and more? Are you into sheaths, sharpeners and other knife accessories? 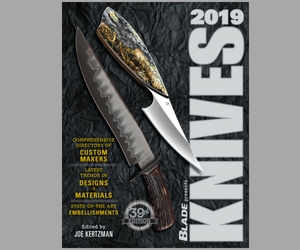 Do you like to read about knife history, military knives, art knives, knife shows, knifemaking schools or something else? Tell us. We will take the results and modify our editorial content to meet your needs. All successful magazines conduct reader surveys and study the results to see if what they are doing meets with reader needs and approval. If what they are doing is not meeting the readers’ needs, successful magazines see what it is the readers want through the survey results and amend their editorial approach to fill those wants. BLADE has been doing it this way for well over a quarter century and the approach must work because we remain the World’s No. 1 Knife Publication and have been No. 1 for over three decades. Please take our survey and feel free to add your comments concerning where the magazine needs improvement, no matter what the area: story content, illustrations, writers, layout and more. And please pay particular attention to the questions concerning how much you participate in social media. Those questions are new to this survey and will be most helpful in determining how we address the worldwide social media phenomenon going forward.